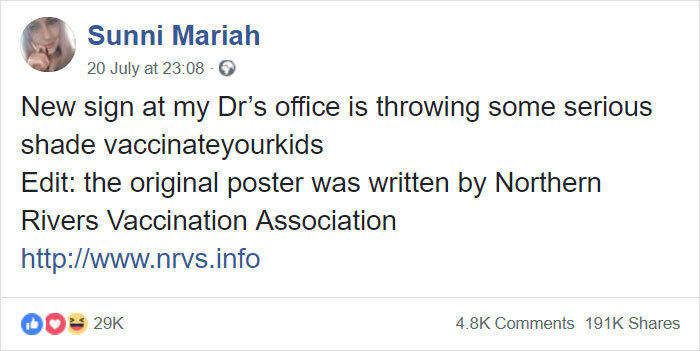 This doctor is doing it right! Do you know the only deadly disease ever to be eradicated was smallpox? How? By using a vaccine. The use of vaccinations dates back to the 10th century. Chinese physicians first used them, but they came into light in the 17th century when Buddhist monks drank snake venom to ensure immunity from snake bites. In 1796, Edward Jenner was considered ‘the father of immunology’, when he injected a 13-year-old boy, James Philips, with cowpox vaccinia virus at least three times which kept smallpox away. Not just that, he inoculated the vaccine on 23 different subjects which included his own baby boy and two years later the smallpox vaccine was invented. In the later years, the legacy continued, and more scientists tried to give this world healthy babies, and those vaccines are even used today with a minor modification in them. Following in the steps of Edward Jenner, Louis Pasteur started the process to develop cholera vaccine in 1897 to make humans immune of a bacterial disease. Due to various vaccinations, people live a fast and steady healthy life today, and therefore, these vaccinations have a massive impact on the world economy. Sadly, some of the people don’t consider these vaccines a blessing and don’t vaccinate their babies. Doctors are now refusing to treat patients over their negligence. Parents believe in some invalidated researches made on vaccinations that they lead to autism. 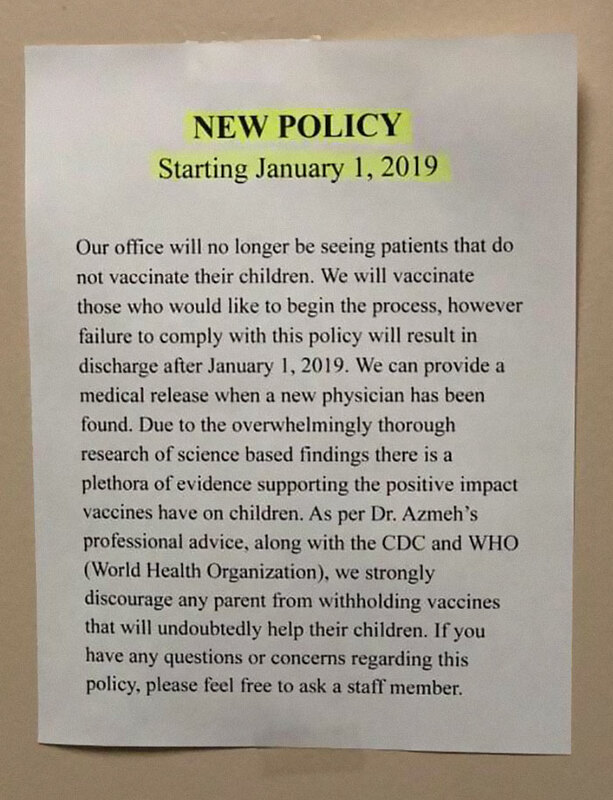 But this one doctor is giving them a hard time for not choosing to vaccinate their babies, and it seems to be working. Immunisations have changed the ugly lifestyle to a healthier one. But a few people in this world still believe in some false research on vaccinations. In my honest opinion, they shouldn’t be given a chance to find a new physician. 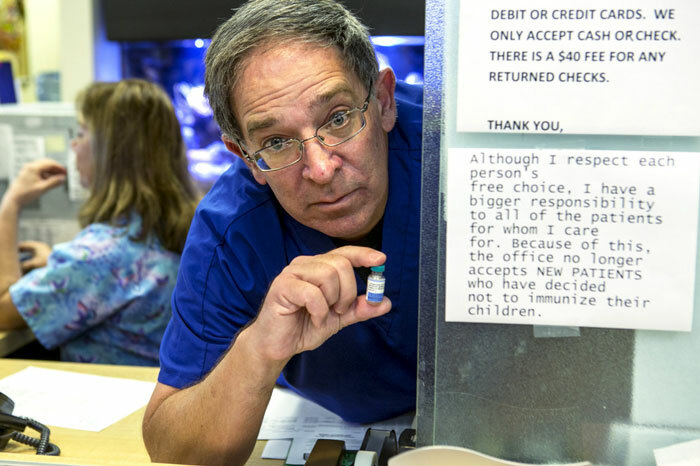 Our office will no longer be seeing patients that do not vaccinate their children. We will vaccinate those who would like to begin the process, however failure to comply with this policy will result in discharge after January 1, 2019. We can provide a medical release when a new physician has been found. Due to the overwhelmingly thorough research of science based findings there is a plethora of evidence supporting the positive impact vaccines have on children. As per Dr. Azmeh’s professional advice, along with the CDC and WHO (World Health Organization), we strongly discourage any parent from withholding vaccines that will undoubtedly help their children. If you have any questions or concerns regarding this policy, please feel free to ask a staff member. When the whole world is against something, they try to synchronise in every way possible, and these physicians are doing the same. They are discouraging people who don’t vaccinate their babies. Although I respect each person’s free choice, I have a bigger responsibility to all of the patients for whom I care for. 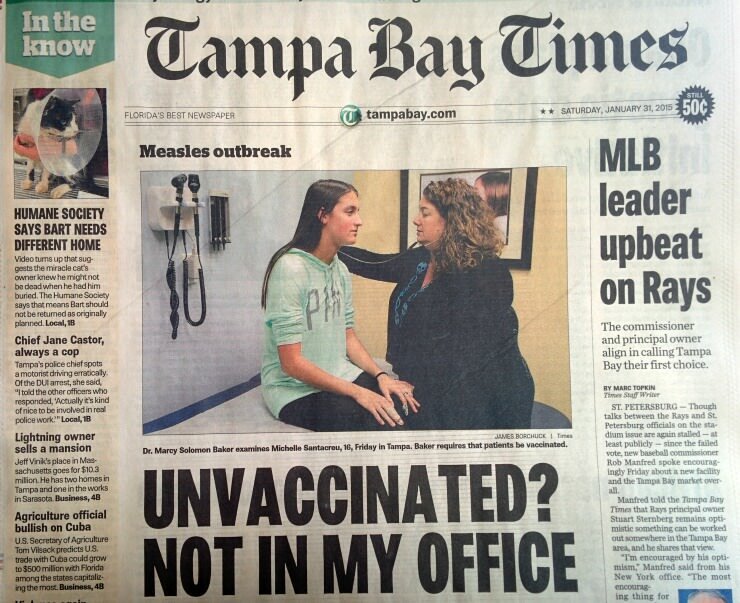 Because of this, the office no longer accepts NEW PATIENTS who have decided not to immunize their children. People who feel proud that they haven’t protected their children must read this and be ashamed. Not vaccinating your kids leaves them vulnerable to disease their whole lives. When your daughter gets rubella when pregnant, how are you going to explain that you chose to leave her at risk? What will you say when she calls you and tells you she has cervical cancer, because you decided that she wouldn’t need the HPV vaccine? What do you tell your son when he breaks the news to you that he cannot have kids, thanks to the mumps that he got as a teenager? And what do you say when he gives influenza to his grandma? How do you explain that she won’t be coming home from hospital? Not ever. Do you tell them that you didn’t think these diseases were that serious? That you thought that your organic, home cooked food was enough to protect them? Do you say sorry? 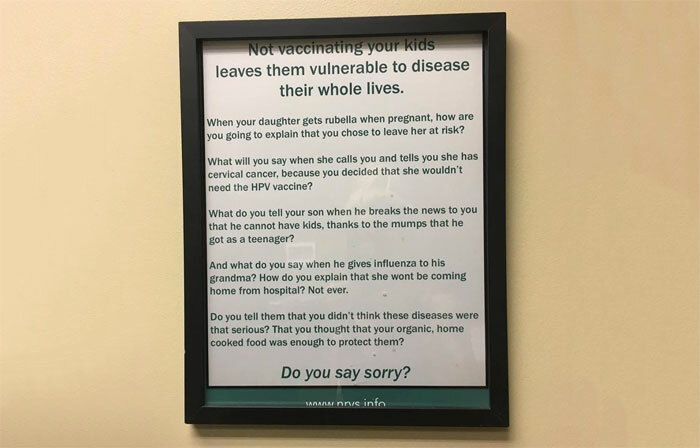 People should be reminded on every visit, by a physician, the importance of vaccinations keeping in mind that they don’t force them and it’s their decision. Let’s see what people all around the world had to say about this matter. This person has nailed it! Their parents don’t give a damn. Good idea but maybe they’re not safe enough to inhale, you know? No one should be that insensitive. A question everyone would be asking right now. When you stop being illiterate. I have just one question; why are people crazy around here? What is your opinion on this matter? Leave a comment below and let us know. So why have courts around the world paid out billions to individuals with vaccine related brain damage? It’s the people who have a critical view of vaccines that push manufacturers to improve those products. A great case in point is the triple MMR Vs the 3 single shots. One was cheaper and occasionally caused serious brain damage. Can you guess which? The people making these choices are asking informed decisions. I wonder if these anti-vaxxers vaccinate their pets? If so, why are their pets getting vaccinated but not their children? Are their pets more important then their children? ?